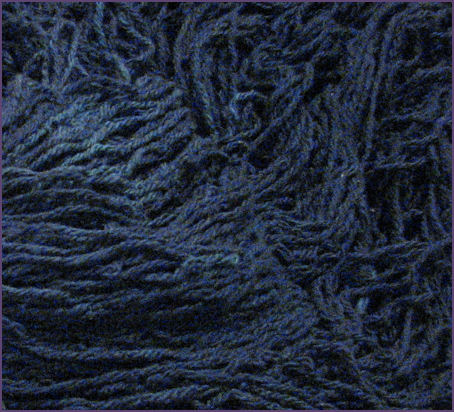 This is, of course, the famous Clapotis. Come on, I know you’ve made one. Haven’t we all? All, except… me. You see, this is my attempt at Clapotis. Probably my second attempt, at that. No, it is not hard to do. In fact, once you get it down, which happens pretty quickly, it is reasonably mindless knitting. Which, you’d think, would be a good thing. But, I guess not! That is, if you happen to be… well, me. I am so bad at finishing anything! I’ve been knitting for 6 solid years, and it’s becoming painfully obvious that my UFO (UnFinished Object) pile is at least 10 times larger than the pile of things I have finished. Sure there have been some lovely hats along the way, but truthfully, not much else. Not even this, my Clapotis. I even have such fond memories of knitting her! Two, the last two balls didn’t look ANYTHING like all the other balls in the lot. That’s what you get with kettle dyed, little did I know. I’d probably be fine with it now, but then, I just couldn’t live with it not matching. I still have this project, what’s knitted and what’s left of the yarn. I still love the yarn, and have spent the last five years trying to decide whether to take the thing apart and make something else with the yarn, since I love it so much, or to just soldier on, and finish the thing. You never know, I might like it after all. The thing is? Once a UFO becomes a UFO for me, it’s pretty much over. I don’t think I’ve ever gone back and finished ANYTHING in my enormous pile of yarny misfits and undone things. It’s not that I don’t love them; I do. I really do. Each project has some cool memories attached to it. I just have an apparent aversion to finishing almost anything. What is it about being done that’s so hard, anyway? At this stage of the game, I doubt I’ll ever figure it out. I even joked with a friend the other day that maybe I should frame some of my UFOs, just as they are, needles and all. Perhaps that in itself makes some sort of artistic statement that I have yet to realize. I suppose, if I ever do frame any of my unfinished lovelies, Clapotis will probably be first. I love her the most. Just look at the header graphic of my blog. There it is, every day. Finished or not, it will always be a favorite. Day Three: Organization? What’s That? That one is obvious what’s in it, and for the most part, they all are. 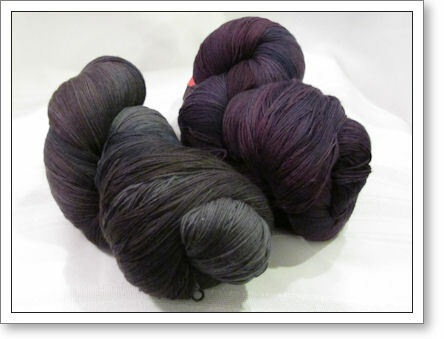 For example, I actually have two bins of Cascade yarns in tons of colors. Are these bins the entirety of the stash? Um, no. Not even I’m crazy enough to show you the whole thing. But, truthfully that is the majority of it. It’s stacked taller than I am! *This, of course, was the theory when I bought the ottoman in 2009. I filled it with yarn for projects I was working on at the time, and THAT yarn is still in the ottoman, even though for the most part, I am not actively working on any of the projects in it. Except that that’s where the Noro Kureyon ended up, which I love to make hats with, and I’ve been using the leftover bits to make a sort of patchwork blanket with. I figure that blanket is going to be the equivalent of my life’s work, because I only work on it a little bit at a time, when I’m between projects, and that, in itself, is rare. This shelf unit is along a long wall and is overstuffed with knitting books and magazines, and a few tools that I need to reach easily, like the blocking squares and the ball winder. 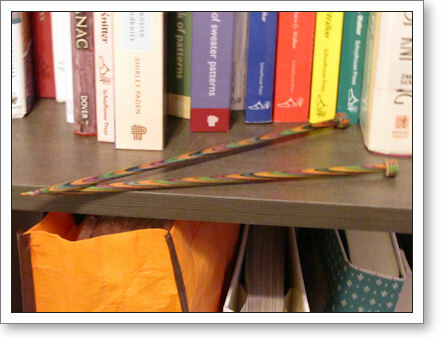 I have them organized by frequency of use; that is, the ones I refer to all the time are easy for me to reach, and the ones I need less often are in kid-climb-after-that-please-and-hand-it-to-mommy range. I have a lot of knitting books. A LOT. I recently reorganized the shelf and was embarrassed to find a couple of titles that I had more than one copy of, and I’ll be sharing them with my knit group. I love having so many books at my disposal. Creativity most often hits me in the middle of the night when the library is closed, and I’m known to take a pile of books down and have them all open and mash together an idea for my knitting. I almost never knit a pattern as is from a book, but I rely on them heavily for inspiration. And, last but not least, is my most favorite organizational tool. My amazing needle case, which is actually a fishing worm binder. It’s a soft-sided case with binder rings on the inside, that hold little ziploc bags that, if used for their intended purpose, would hold live bait. Well, forget the bait! 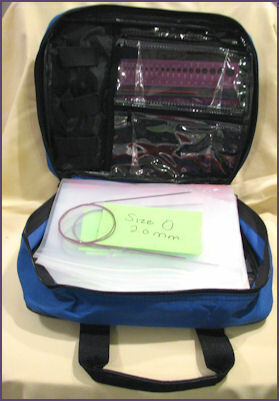 Each bag holds a different size of needle tips and then one bag holds a variety of cables in various lengths. The inside of the bag itself has tons of tiny pockets that are perfect for stitch markers, end buttons and the needle “tightening key.” There’s even one pocket on the inside which is exactly long enough for my needle sizer tool. It’s ugly, and has a big fish on it, but I love, love, love my needle binder. Does all of this mean that I am organized? I’d be lying if I said that I was. But, I try. 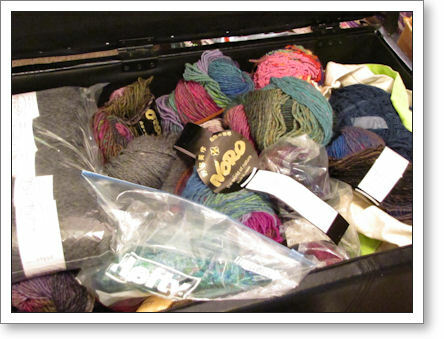 And, for the most part, if I want a particular yarn, I pretty much know which bin it’s in. 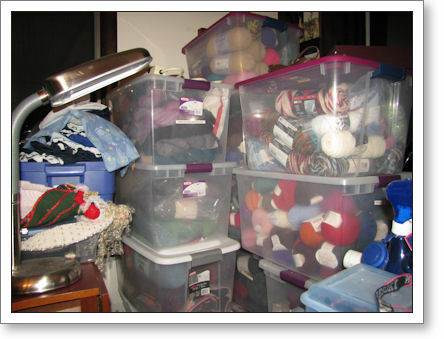 I probably have more stash at this point than I can knit for the rest of my life… and I am hoping it doesn’t get to the point that it completely takes over my house. Wish me luck on that! 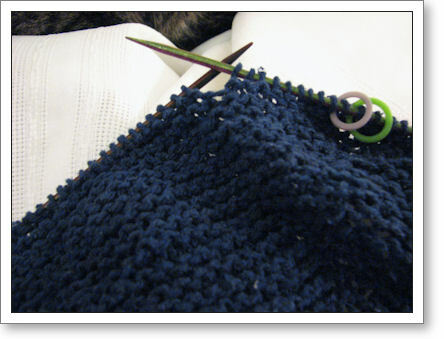 Today’s Knit and Crochet Blog Week topic is supposed to be something about “what new skill have you gained in your craft over the last year?” I’ve struggled all day and don’t really have an answer. So, I’m pulling the wildcard, and sharing some exciting yarny yummies that I received this week. 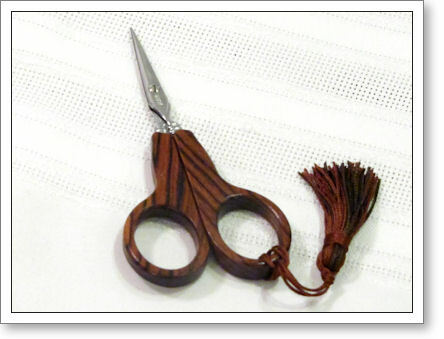 They are Sajou Kingwood Handled Scissors. They are a huge splurge for me but they are so lovely! And POINTY! Wow. I sure hope I never sit on them. So I guess this means that it’s official: I’m on a lace kick. My current shawl is stitch patterns that I have done before and know from memory but maybe by this time next year? I can write that I am the Ace of Lace. Next year, I will have a new skill. Next year, I will have completed more than one thing to show for all of my hours of knitting. It’s Day One of Blog Week. Today’s topc? Yarn. 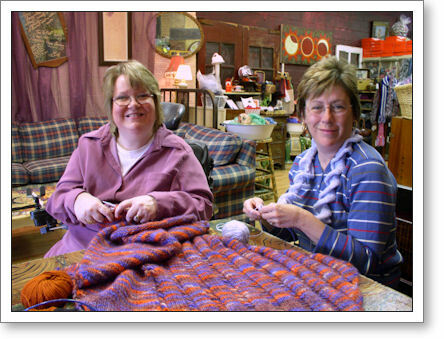 I’m going to tell you about two yarns that I’ve gotten and attempted to knit the same project with them. Namely, the February Lady Sweater. Still, I found it incredibly hard to work with. My first ball got all tangled up on itself inside and when I yanked on it at one point, three ends started coming out. Obviously, there’s a knot somewhere inside my giant yarn ball. I had someone working on it, but that was long ago and we gave up. Also it was my first time doing buttonholes and they looked funny. Which wasn’t a reflection on the yarn as much as the knitter, but I think I will need to start this project from scratch and with another ball and then go back to my original yarn ball if and when I can get the knots out. Someday I will have my raw silk sweater. But, not just now. I am finding this yarn dreamy to work with. 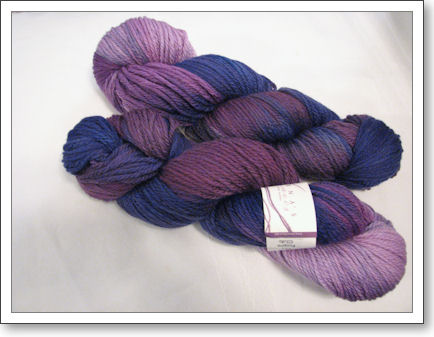 It is wool, so very forgiving in the hands, and, did I mention it’s purple? That counts for a lot in my book. Of course, I’m really bad at finishing anything. I’ve been working on it for more than a year, and it’s been on a serious break for about 6 months or more. I think I need to start working on it again if I am ever going to wear a February Lady. So, if this one is going so much better, why is it not done? You know why? 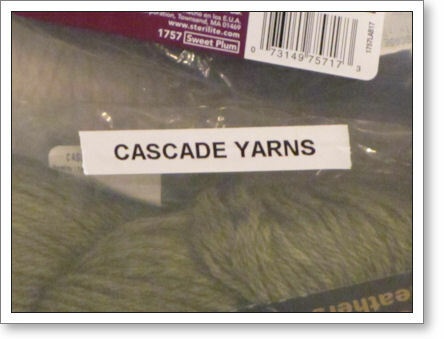 Because it’s not the yarn–it’s me. I’m bad at finishing anything. 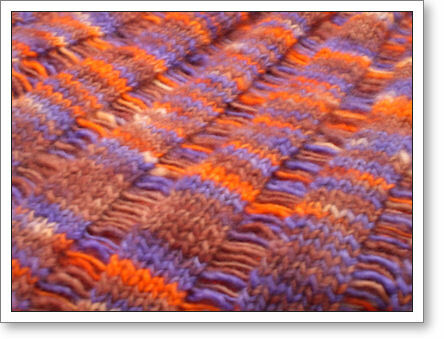 I think in all of 2010 I finished exactly one thing, and it was just a scarf. I’m coming to the realization that I like having knitting in my hands, love feeling yarn and playing with yarn, but I hate actually making things. Is that weird? I know that makes me a quintessential process knitter, but I’ve taken it to the extreme. And my own lack of stick-to-it-iveness has meant that I don’t have anything really to show for these two beautiful yarns. Except, I can tell you, they’re both wonderful. Trust me on that. I guess maybe being beautiful is just enough for me. It doesn’t actually have to BE anything, except lovely to my eyes and soft in my hands.